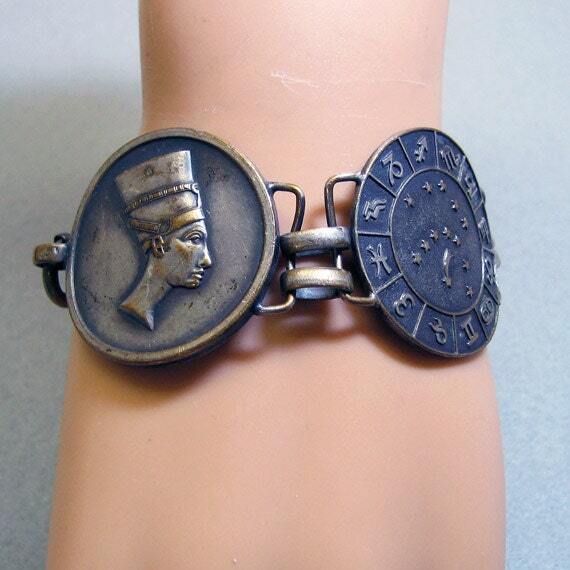 This outrageously fun bracelet uses Big 1 3/8ths inch diameter aged brass discs to portray vignettes of Egypt. You have Nefertiti, a zodiac chart, a pharoah and Cleopatra's asp snake. The reverse side shows a pyramid in the desert. The bracelet is in excellent condition and measures 8 inches long. It fastens with a spring ring clasp. I don't see any maker's markings. If you like the different, the odd and the unusual in your jewelry, please check out my Etsy store at www. etsy.com/shop/pandpf.